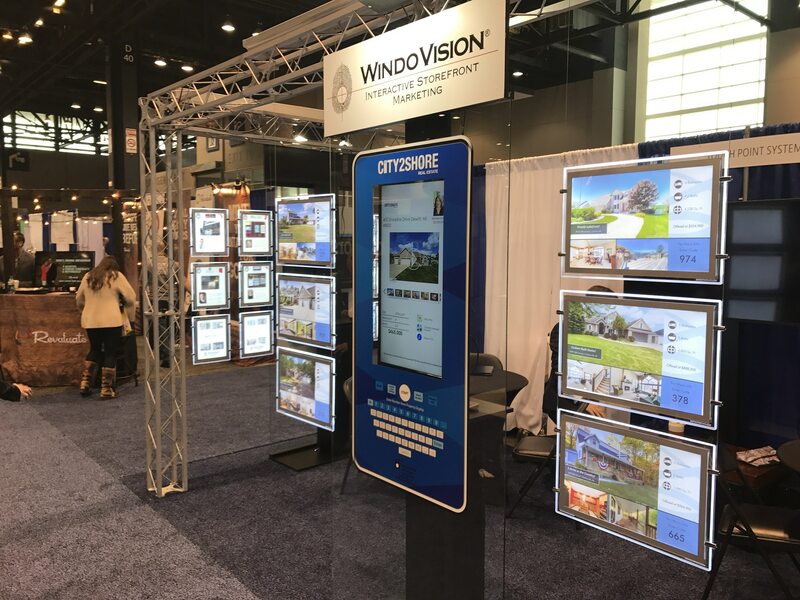 For the 11th consecutive year, Touchpoint Systems showcased WindoVision at the National Association of Realtors Expo. This year’s Expo, held in Chicago, drew realtors from all over the world to experience some of the hottest trends in Real Estate. Touchpoint Systems, a Michigan based company, is the market leader in one of the fastest growing trends, Interactive Storefront Marketing. ISM is the concept of combining current technology with old fashion brick and mortar storefronts. WindoVision, Touchpoint’s interactive model, utilizes state of the art components to turn any high traffic window into a Real Estate Information Center. This year’s model WindoVision 6 features a 32″ multi-touch touchscreen along with through glass keypad. The latest software interface is optimized for full website and video integration. The 10′ x 20′ booth featured 3 WindoVision touchscreens alongside its signature LED displays. Touchpoint took the opportunity to brand the demo systems with a couple of current customers. The Featured System in the center of the booth bore the design of City2Shore Real Estate, a new customer that is already seeing dividends. City2Shore Owner Shelley Frody stopped by the booth to see her branding and talk to potential clients. The Expo Media group NAR Conference Live caught up with Shelley to discuss her recent WindoVision installation. The LED displays, provided by Distinct Displays, complimented the touchscreens by showing off printed images with near digital clarity. A far cry from the old paper fliers on the window of the local realtor. “I thought it was a screen, those fliers looked so good” noted one visitor to the booth. “They really get you to stop” added another. Show Shoppers were able to take advantage of the offer of free exclusivity with the purchase of a system. The offer allowed clients to “lock out” their competition and get a leg up on acquiring listings. Due to the overwhelming response, Touchpoint decided to extend the special through the end of November in order for each attendee to learn about the product.